What is an Outsider Artist anyway? Bill Traylor was most likely born around 1853. He was a slave on a cotton plantation in Alabama. Traylor began drawing at the age of 82 and his “studio” was on the sidewalks of Montgomery, Alabama. Only after his death was he recognized as a great talent. The rough-edged drawings have an uneven geometry that turns every human gesture into a mangled dance. THE SMITHSONIAN AMERICAN ART MUSEUM (SAAM) mounted the first-ever major exhibition devoted to the work of an artist born a slave. 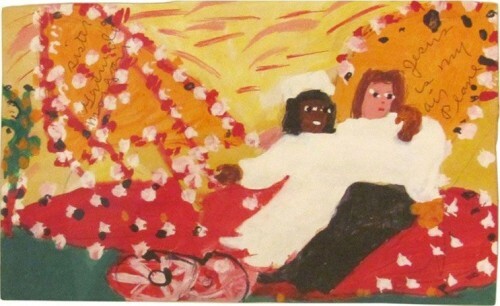 Sister Gertrude Morgan was a poet, a preacher, an artist, and a singer who loved Jesus. She called Jesus her husband, her doctor, and her airplane (yes, airplane), and claimed to have met with him in visions throughout her life. Born on a farm in Alabama in 1900, Sister Gertrude left school after third grade so that she could help her family with the farm work. Preaching the gospel tirelessly in the streets of New Orleans, Sister Gertrude founded an orphanage and ministered to the sick and the inmates of Orleans Parish Prison for years. Sister Gertrude’s paintings were little figures of herself in a white bridal gown standing beside a pudgy little Jesus wearing a tuxedo. Other images pictured her and Jesus in an airplane flying around heaven. She was adamant that her paintings were divinely inspired and indeed, perhaps they were. Sister Gertrude died in 1980, at eighty years of age. Her paintings have been exhibited and celebrated in prestigious museums such as the American Folk Art Museum and the Philadelphia Museum of Art. “Jesus is My Airplane” sold to a private collector for $20,700. 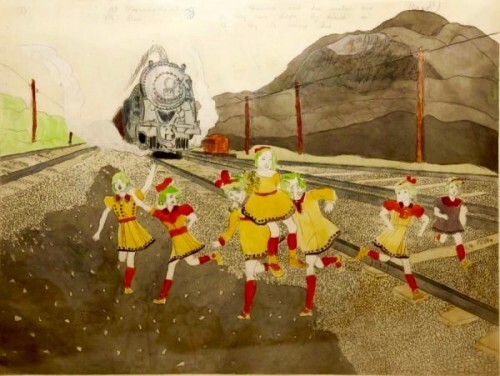 Henry Darger’s story is heartbreaking, but he left the world a treasure trove of art. Tragedy found Henry Darger early and often. When he was 4 years old, his mother died. Unable to care for him, Darger’s father placed him in an orphanage. At 16, Darger ran away and for the next 64 years lived alone as a recluse in a rented room while working as a janitor in Chicago. His landlord, cleaning out Darger’s rooms, made a startling discovery: alone in his room, Darger had created hundreds of beautiful, large paintings illustrating an epic fairytale he had written over 60 years. A brilliant artist, hidden from the world in the guise of a lonely janitor, Henry Darger has become internationally known and is represented in major museums throughout the world. Thanks for the tip on the Outsider Show at the Mengei Museum, San Diego, Alice! Outsider art is being recognized more & more. I just love that these people are being recognized. 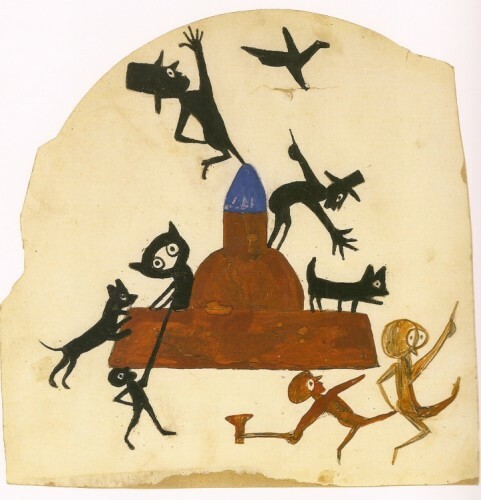 It seems like everyone knows Henry Darger”s sad, odd story, but I’ve never heard of Bill Traylor. And I LOVE his work! Thanks for enlightening me. You always do. Thanks Kirby. I never knew any of that! Such a wonderful blog on artist that were unknown till their passing. Works of true love of creativity by the artist. I love this blog. You’re amazing. Have you seen the current exhibition at the Mingei? William Hawkins is another outsider & late bloomer (don’t we just love ’em) – the work is remarkable. I LOVED this blog!!!!! Especially the Darger story. Fascinating!!! Thanks for sharing these stories! And he didn’t start drawing until he was 82! What great artists. Thank you for introducing me to them. Love your information and art. Thank you for bringing Outsider Art to the attention it deserves. Several years ago, I visited a museum in Baltimore that was devoted to outsider art. I never heard of art being outside–or inside. As far as I am concerned, it is all “inside out”. A mystery to all of us who lack the vision to “see”. Thank you, Kirby, for this insightful glimpse into 3 outsiders who have managed to wiggle inside. Thank you for increasing my knowledge. I am a fan of your work and now Bill Traylor. Thanks for doing this. I let my sad feelings linger for a while in response to what you wrote. Reminds me of how often we people never know what is going on within other people…..even though we also often THINK we know. There’s a lesson here, although it is an artful thing to try and reach out to people. I will remember Henry Darger as I walk by total strangers. Hi, Kirby, thanks for the glimpse of this intriguing art! Thank you Kirby for keeping me on your blog. Love the different educational formats, and I always love the art! Love the format and education. Always love the art! Think of you often. Linda Kay and I love your blog. We want to know when you will be coming to Memphis. Catch us up on your life. Thank you Kirby – you wake me up!! I always love reading your posts! Thanks for sharing! !